I always look forward to the time that the outdoor farmers markets start up. Though to be honest, the first few weeks are always a little disappointingly scant on the fruits and vegetables. Spring in the upper midwest isn’t quite the most bountiful season for produce. It’s mostly ramps, spring garlic and onions, the odd bunch of radishes, potatoes stored over the winter, and stand after stand of green and purple asparagus. 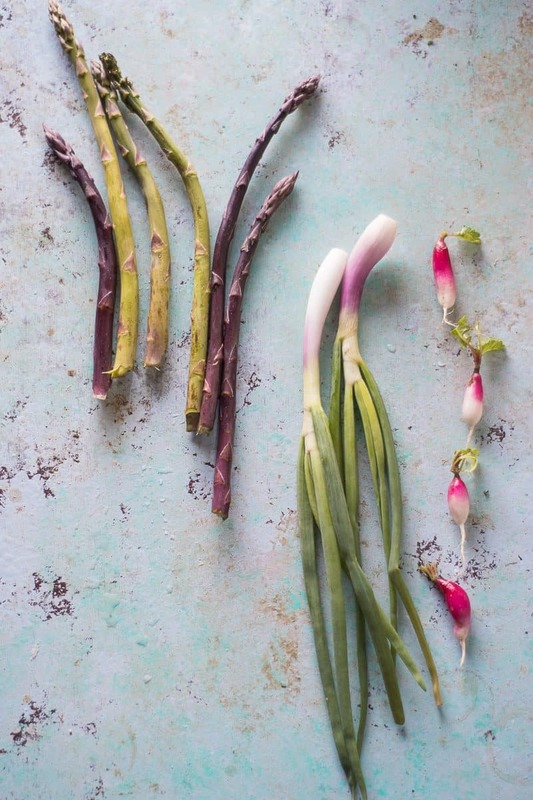 Still, there’s something painterly about the wash of pale greens and purples and pinks, vegetables with a soft cherubic blush. Something that will all too soon give way to the brighter and bolder saturated colors of summer. And in-season asparagus is always a treat. I brought a few precious bunches home and threw together a simple spring market skillet. 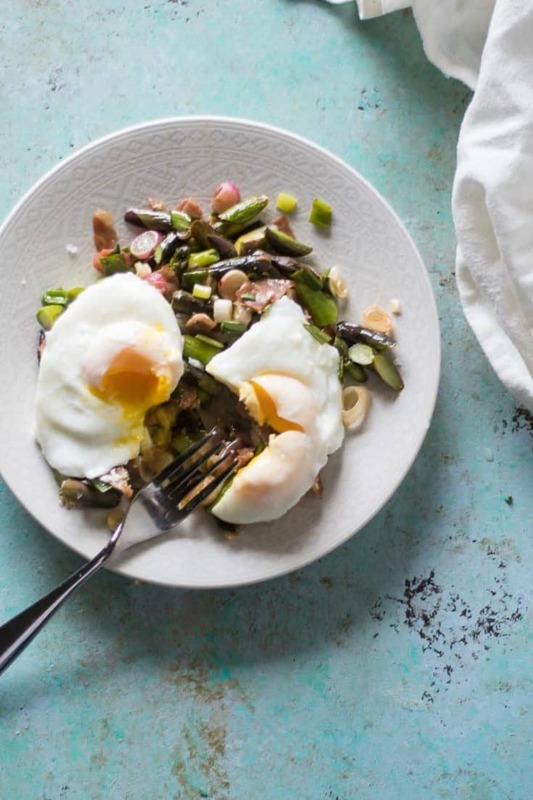 It’s a simple saute of asparagus, radishes, spring onions, and prosciutto topped with runny poached eggs (or, really, any kind of egg preparation you like, a crispy fried egg or a 7-minute egg would also be delightful here). And it makes a winning breakfast or simple light lunch. I usually reach for olive oil or some kind of neutral oil like grapeseed for sauteing vegetables, but spring vegetables love love love butter, so that’s what I reach for here, though of course if you avoid dairy you could always swap it out for a nice buttery olive oil. 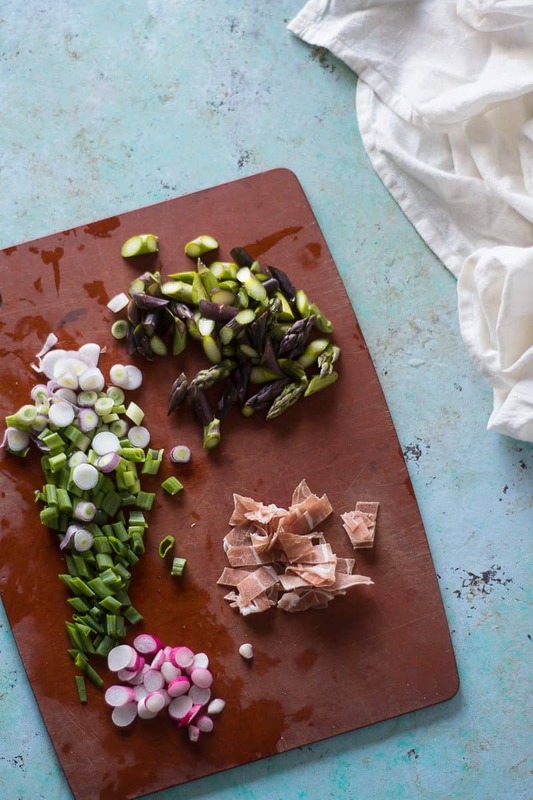 The onions provide a sweetness, the asparagus a grassy note, the French breakfast radishes a mild peppery quality, and the prosciutto a salty umami flavor along with some fatty richness. I add the tiniest swirl of champagne vinegar at the end for a little smack of acid (the laziest way to hint at the flavors of beurre blanc) and top the whole thing with runny eggs that meld with the butter to make a delightfully unctuous sauce. It’s the sort of dish that takes well to adaptations. If you don’t find radishes at your market, leave them out. If you came home with beautiful mushrooms you can’t wait to use, throw them in. But it’s one of my favorite ways to enjoy the first spring vegetables. This is an infinitely adaptable dish. Feel free to adjust the vegetables to what you have. I think an oniony component is nice here, so if you don't find spring onions then going with leeks or shallots or green onions would be good options. Purple asparagus slowly turns green when it's cooked, but at the crisp tender stage mine still retained a hint of that purple color. I usually add fat to a pan before adding in the vegetables, but in this case, I add the vegetables and butter at the same time to avoid burning the butter (a little bit of browned milk solids are delicious, but burnt turns bitter and is a pain to clean off a pan). Do use a decent Champagne or white wine vinegar if it's in your budget--it makes a difference. This serves one person, but is easily scaled up. You'll want a skillet, a wide sauce pan or saucier, a decent cutting board, a chef's knife, and a slotted spoon for this recipe. 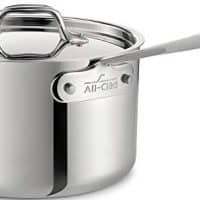 Fill a small wide saucepan about two-thirds full with water and bring to a boil. Crack each egg into a small bowl or teacup. While the water is heating, place your skillet over medium high heat. 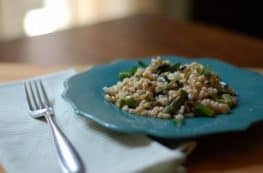 When the pan is hot, add the butter, asparagus, spring onions, radishes, prosciutto, and a generous pinch of salt and saute until the onions are beginning to brown at the edges and the asparagus is crisp tender, about 3-5 minutes. Remove from the heat, add the vinegar, and stir. Taste and add a little more salt and some pepper if you like. Transfer to your plate. When the water comes to a boil, reduce to a simmer and add carefully add the eggs one at a time to the pan. Let simmer for about 3 minutes for a runny egg yolk. 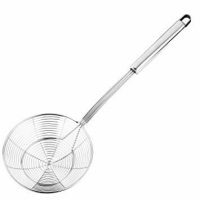 Remove with a slotted spoon and add to the top of your vegetables. Season with salt (flaky sea salt is especially nice here) and some black pepper if you like. Serve. 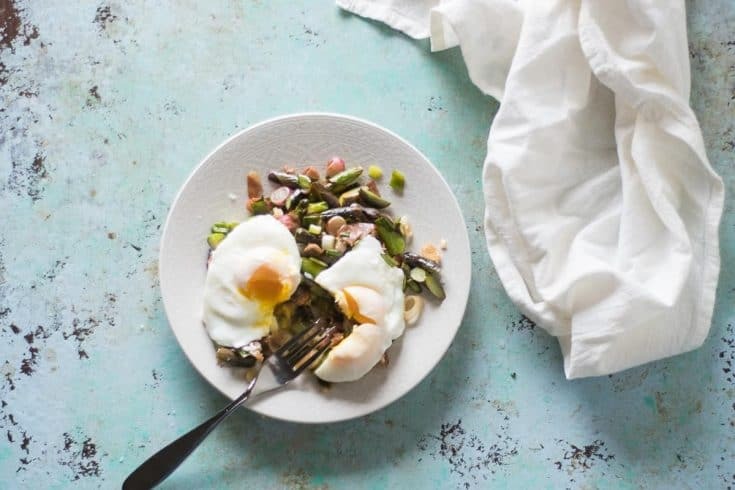 Poached eggs with vegetables are my favorite breakfast (or lunch… or dinner..). Such a perfect spring or summer meal! I, too, love poached eggs! 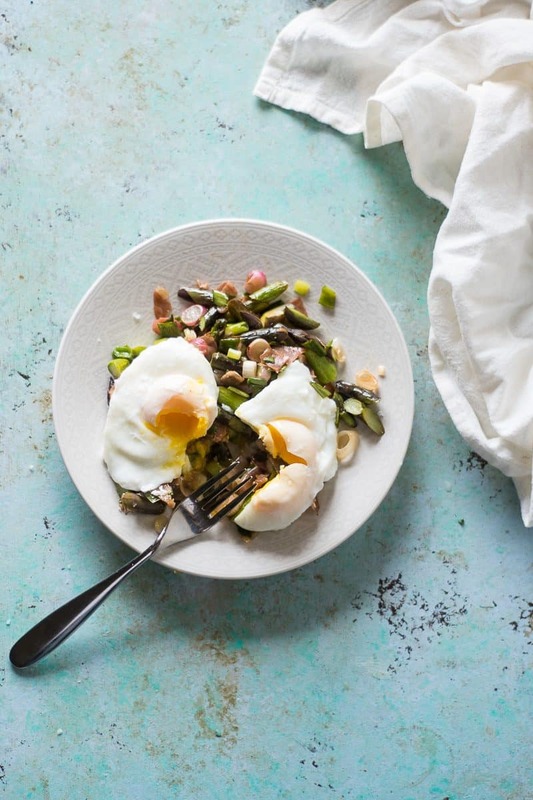 I’m all about anything with a poached egg on top. 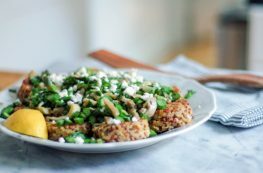 I wholeheartedly agree about spring vegetables and butter—they’re much more tender and flavorful. They’re a classic combination for a reason! Love it!! So simple and delicious. Like any food should be. What a nice job putting seasonal ingredients together for a beautiful, healthy meal! This is how my perfect breakfast looks like! Healthy and delicious- I couldn’t ask for more!